Believe me, readers—I’ve heard you. You’ve asked that question a lot in the past year in comments, on Twitter, to my face at conferences. And I get it. You already have a PC (or at least I assume you have one, since you’re reading PCWorld) and you don’t want to buy another $500-$1000 machine for the living room. I’m in the same situation. Piece by piece I built my computer into quite a capable little gaming rig, and I’m loathe to shell out the same cash twice—I’d rather just upgrade my main machine. So look for my colleague Gordon Ung to talk about Steam Machines and all the different configurations available in a report tomorrow. I want to talk about the things that will potentially change the way I personally play games: The Steam Controller and the streaming-centric Steam Link. There’s certainly a Frankenstein-esque quality to the Steam Controller, which was originally conceived as a way to replicate keyboard-and-mouse functionality in a gamepad. It’s like someone cobbled an Xbox controller together from parts found in a back room with only a vague recollection of what an Xbox controller is supposed to look like. It’s the Xbox controller other Xbox controllers are afraid lives under their bed. Two massive, circular touchpads with haptic feedback built in. Four low-profile shoulder triggers (two digital and two analog, with digital clicks at the bottom). The standard ABXY diamond, with a color scheme lifted directly from the Xbox. Two rear “grip” buttons activated by your remaining fingers. A Start/Select pair and a Steam jewel in the center. And then a single analog stick sticking out on the left side. It looks absurd, after years of conditioning. It looks, in all honesty, like the kind of wacky input devices Nintendo devises in its unending quest to make a controller no human on earth could use. And I’m awful at using it. That’s the other takeaway I’ve gathered so far. Fifteen years of muscle memory have trained me to be a pro with a dual analog stick controller. Fifteen minutes with a Steam Controller is like watching baby’s first steps all over again. For its part, Valve says it should only take an hour or two to get used to the controller. I don’t know how true those claims are, but the point is it’s like any other skill—you practice, you get better, and eventually you’re a master. Is the Steam Controller worth mastering? I think so, yes. Yeah, it looks ridiculous. Yeah, the analog stick is a weird and awkward concession that somewhat ruins Valve’s original vision. But that’s the most interesting thing about the Steam Controller: It’s a fascinating piece of hardware hidden under a mountain of compromises. It’s a weird device, don’t get me wrong... But it has some benefits. In my opinion, it’s clear Valve would love to sell you a controller consisting purely of triggers, grips, and two massive haptic pads. But then it put that controller out there as a prototype and people went “I don’t get it,” so they added the diamond-shaped ABXY. Then they added an analog stick. Now they’d like you to stop using them. The analog stick and the ABXY buttons are like training wheels. At one point during my demo of Unreal Tournament I complained how hard it was to get my thumb over to the ABXY buttons and then back on the right haptic pad. Valve flat-out told me, “We’ve found that the best control schemes don’t ever force you to take your hands off the pads.” Those buttons are an extraneous compromise to people like me (and maybe you) who are so entrenched in an ABXY culture that we don’t feel comfortable giving it up, even though the Steam Controller’s touchpads click in and thus somewhat emulate the ABXY buttons on their own. 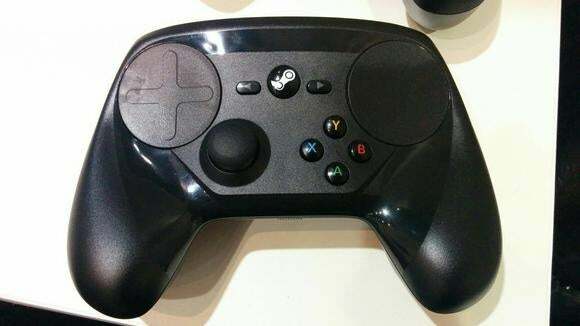 Valve’s goal seems to be to trick you into taking advantage of the Steam Controller. By adding an analog stick and the ABXY buttons they’ve made it more palatable so you’ll check it out. And then once you’ve checked it out, you’ll (they’ll hope) realize the old control schemes are way less efficient. 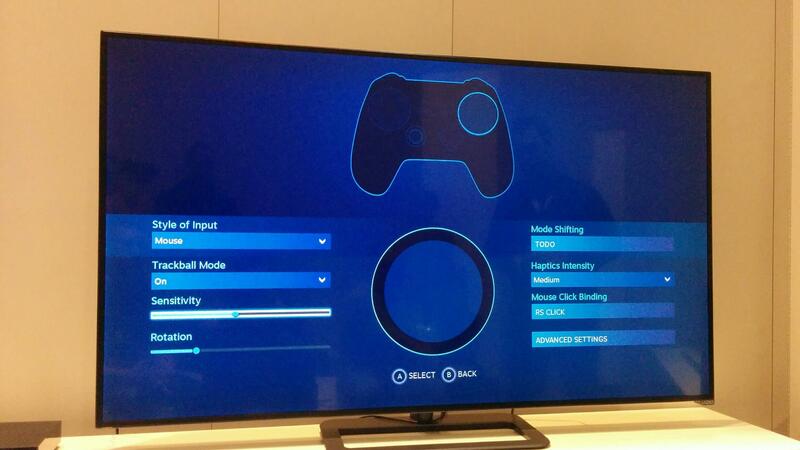 The interface used to remap the Steam Controller’s buttons. That’s also why they’re putting such an emphasis on customizability. The community can upload control schemes for any game—control schemes that can be voted on by the rest of the game’s players. Whichever control scheme is highest-rated becomes the automatic Default for the game unless the developers provide their own. It’s a weird device, don’t get me wrong. This is my fourth time using a Steam Controller and I stll barely know what I’m doing. But it has some benefits. The two trackpads are definitely more mouse-like than an analogue stick, and the haptic feedback enables you to do all sorts of things you couldn’t before—like making the right pad (mapped to camera in every game I played) function as either a mouse (1:1 movement) or a trackball (momentum). I think it’ll take longer than an hour to get used to. But I’m willing to try. I’m especially willing to try because it’s supported out of the box by Steam Link, and I’m...well, I’m hoping Steam Link can live up to what I saw during my demo. 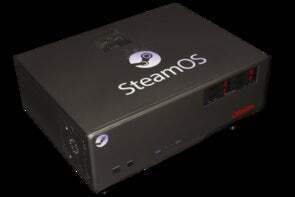 The streaming-only Steam Machine is exactly what I thought was missing during the original Steam Machine unveiling at CES 2014, so I was excited to get my hands on it. I’ve tried Steam’s computer-to-computer in-home streaming already, as well as the NZXT Doko, Nvidia’s GRID and Gamestream, and Microsoft’s Xbox One-to-PC streaming—so I had some idea what to expect. The best part of Steam Link is that, as far as my demo is concerned, it worked. 1080p, 60Hz game streaming from a computer to a TV with minimal lag. Now, it’s key to remember that all these impressions only pertain to my demo. Demos are the equivalent of a busker selling snake oil out of the back of a wagon. “It’ll cure your baldness! It’ll get the aches out of your joints. Try this out and see how amazing it is!” You can’t trust anything at these demos, because you’re essentially seeing a product in as ideal an environment as the publisher can give you. In our case, it’s with the Steam Link and a computer wired directly together in a tiny six foot by five foot cubicle. In other words, nothing like an actual apartment (unless you maybe live in a closet in Brooklyn) and with as little lag as Valve can feasibly get. I hate to use the term “Apple-like” but you kind of have to—it’s just a smooth grey box with a single, indented Steam logo on top and a few ports hidden on the back. But they did it. There is still a small bit of input lag, but it’s minimal enough that I could actually play a game without feeling half-drunk. Other hardware manufacturers have not been able to accomplish that, even in their own controlled demo environments—I’ve seen lag that varied from 50 or 60 milliseconds (Nvidia in-home streaming) to much longer (Xbox One-to-PC streaming). Again, whether those results will hold up when I’m reviewing Steam Link in my apartment, I don’t know. I’m much more hopeful than I was going into my demo though. As for whether it’ll blend into your home theater, well, the thing is so small I think it could be mistaken for a coaster. I hate to use the term “Apple-like” but you kind of have to—it’s just a smooth grey box with a single, indented Steam logo on top and a few ports hidden on the back. 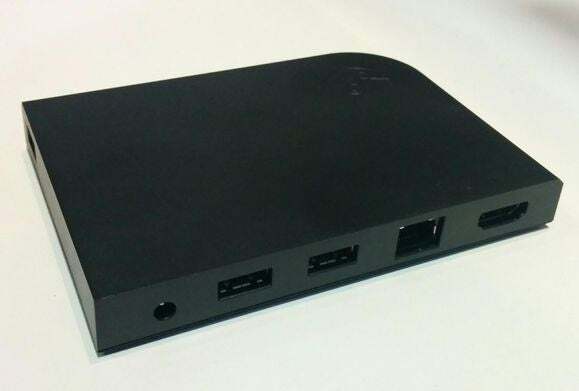 One last interesting thing I learned: Despite early reports that this was a “Steam streaming machine,” I confirmed with Valve that you can in fact stream anything from your PC, including just your pure desktop environment (or a browser running Netflix, Spotify, whatever). We’ll see how it all turns out—or whether the thing ever releases. I’m still not willing to bet on Valve releasing any hardware, even though I used it and played on it and it all seemed ready for production. But assuming it comes out? For $100 for both the Controller and Link, this is looking like the best deal for people who have a decent in-home network and want to move PC games to their TV. We’ll take a more in-depth look in the fall.